STEAM TEAMS: Do you have student leaders in your school that are excited about STEAM? Check out our new STEAM TEAMS initiative! Make Me! Participate in STEAM making challenges and utilize cross-curricular teaching resources. Watch the Make Me! Challenges page for the first challenge on civilizations. Class visits to the STEAM-3D Maker Lab: Want to engage your students in hands-on making activities? Bring them to the Lab! We can design a program that meets your students’ needs or fits into your desired curricular focus. Whether you’re an educator, parent, student or maker at heart, UOIT’s Online Maker Modules will help you explore Makerspace tools that will expand any maker’s knowledge of how to create and/or engage in rich learning opportunities. Participants will gain a deep understanding of various Maker tools and the pedagogy and best practices that go hand in hand with using these tools. If you’re interested in learning more (even if you’re not an educator) please see link to find out more information. In addition to the Maker Modules, we are offering Technology Certificate Courses. 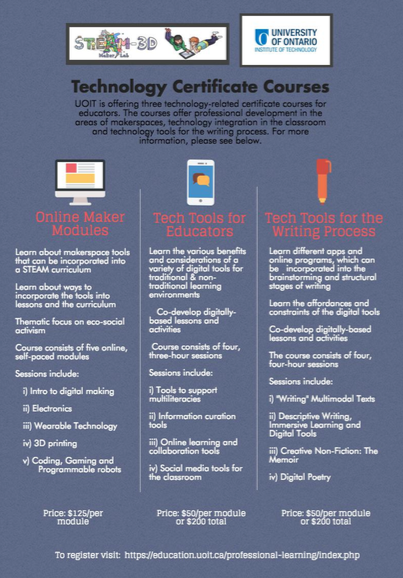 These courses allow you to gain professional development in areas of Makerspaces, how to integrate technology into the classroom and how to enhance the writing process using technology tools. Take 1 course or take all 3 to broaden your understanding of Makerspace pedagogy and how it can be used in the classroom. Please see links below for more information on these certificate courses.